PORT ELIZABETH, South Africa, 6 December 2017 – From 2018 Continental will be an official partner of the Tour de France, entrenching the pioneering German tyre manufacturer’s reputation for producing best-in-class tyres for the original equipment and replacement markets, covering everything from cars to trucks, motorcycles and, of course, bicycles. 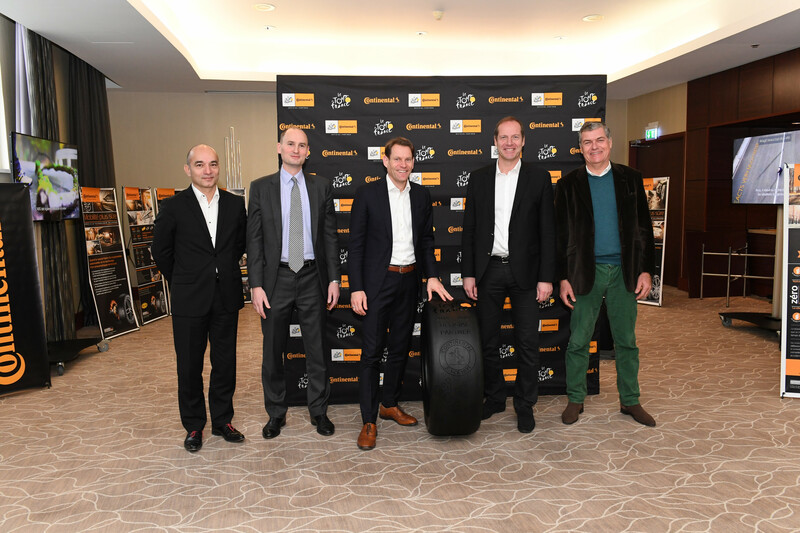 The sponsorship agreement was officially announced in Paris by Christian Prudhomme, General Director Tour de France, and Nikolai Setzer, Member of the Executive Board of Continental AG responsible for Corporate Purchasing and head of the Tire division. “For Continental, becoming an official partner is the logical next step in our commitment to the development and production of high-tech tyres for racing bikes – tyres that are also used in the Tour de France,” underlined Setzer. “Through this move we are demonstrating our great tyre manufacturing expertise in a unique environment of worldwide significance – a cycle race that not only demands the ultimate in safety but also calls for benchmark standards in terms of rolling resistance and weight.” Last year alone, nine teams competing in the Tour de France ran on Continental tyres, with four-time Tour de France winner Chris Froome taking the 2016 and 2017 titles on Continental rubber. Continental is also extensively involved in triathlons and all forms of mountain bike racing internationally, with some of the top names competing on Continental tyres, including the likes of Danny MacAskill, Martin Söderström, Kenny Belaey, Sebastian Kienle and the Brownlee brothers Alistair and Jonny. It’s not just internationally where Continental has a proud heritage and involvement in cycling, as Continental Tyre South Africa (CTSA) is actively involved in this dynamic and rapidly growing sport locally too. Continental is the joint title sponsor of The Herald Continental Cycle Tour which takes place in Port Elizabeth in February each year, with a three-year partnership that commenced in 2017 for the 32nd edition of this extremely popular event. As the second-oldest cycling race in South Africa and the biggest in the Eastern Cape, The Herald Continental Cycle Tour hosted over 3 000 competitors in 2017, who competed in road, mountain bike and team events spread over two action-packed weekends. “The Herald Continental Cycle Tour is one of South Africa’s most popular cycling events, and provides the ideal showcase for our cutting-edge German technologies in both passenger car tyres and bicycle tyres, which are recognized as industry leaders in their respective segments,” says Shaun Uys, managing director of Continental Tyre SA. One of Continental’s core technologies is the Black Chili compound, which provides superior grip on any road surface, providing tangible benefits in performance and safety. Black Chili is used in the SportContact 6, which is its most advanced ultra-high performance car tyre ever, as well as on its renowned race-winning road bicycle tyres such as the Grand Prix, Grand Prix TT and Grand Prix 4000S II. On the mountain bike (MTB) front, the Continental Mountain King, X-King, Race King and Mud King also rely on Black Chili for superior handling and grip in the rigours of mountain biking terrain. Continuing the MTB theme, Continental is a partner to the Fat Tracks Mountain Bike Club in Port Elizabeth, which is the oldest mountain bike club in the country, established in 1989. Fat Tracks organises races and social rides throughout the year, and is committed to creating a family-friendly cycling community catering for everyone, from novices to experienced riders. The club’s extremely active committee is constantly developing and maintaining a growing network of superb mountain bike trails in and around Port Elizabeth. The trails extend through the Baakens Valley to the Port Elizabeth Harbour, easy-going routes adjacent to BayWest Mall and a series of challenging mountainous tracks starting off at Crossways Farm Village and traversing the Longmore Forest plantations.